Secure the LDR to the wooden door or cabinet, to be protected in such a way that when someone tries to open it, a shadow falls on the LDR and the circuit is activated and produce a pleasant sound the buzzer. This electronic eye circuit diagram using NOT gates of CMOS I.C CD 4049. CD 4049 contains six independent NOT gates in a single package; We used alone. NOT gate output goes to a high level (1) when the input terminal 3 is in less than 1 / 3rd the supply voltage, on the contrary, the output becomes low (0), when it is higher than 1 / level 3. So small change in the voltage of pin-2 is enough to change the level of output (pin-3) from 1 to 0 and 0 to 1. The output has only two states high and low and can not remain in any intermediate stage. It is powered by a 9V battery for portable use. The circuit is economical in power consumption. Pin 1 is connected to the positive supply and pin 8 is grounded. 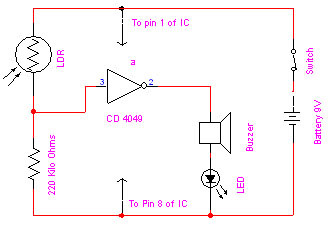 0 Response to "LDR Based Electronic Eye-Project Circuit Diagram"